One of the biggest advantages of becoming self-employed is the ease with which you can start up and run your new business. Here are a few essential tips to remember before becoming self-employed. If you are buying equipment for your business you might be able to get tax relief in the form of capital allowances. These capital allowances are for equipment, which you buy to keep and use for business purposes, such as tools, computers and vehicles. However, the allowances do not cover things that are bought for and sold as part of your trade. In order to update your employment status to self-employed you can register with HM Revenues and Customs online. It is essential to register as self-employed otherwise you will risk facing a fine! To ensure your business runs as smooth as possible make sure that you have the correct credit management system and payment procedure in place. It is also vital to have an efficient cash flow, with systems in place to ensure that money is coming into the business as well as going out. By keeping a full and accurate record of your finances from the start it will make it easier to work out what you owe in terms of tax and National insurance. You must keep a record of both business and private financial records for six years. If you fail to keep records there is a risk you might end up paying too much tax or a fine of up to £3,000. Tax returns – keep the taxman happy! 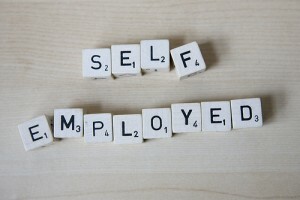 Being self-employed will mean that you will need to take care of your National Insurance. Firstly you may end up contributing too much and secondly you risk losing out on state benefits that are related to the amount of NI contributions that you have made. In conjunction with this, you are also required to complete and submit your tax returns. You can speed this process up by doing it online. This process saves time and it also calculates your tax automatically.